State education leaders recognized 44 Idaho high schools Wednesday as top performers for posting achievement in the 90th percentile in one of several key academic indicators. The state honored top-performing schools and other schools that hit interim targets for state goals at the same time it released a list of 29 low-performing schools. The state recognized far more schools as top performers and goal-makers. Hundreds of schools made these lists, and some schools appear on multiple lists. (Click here to search through the lists for your school. Scroll to the headers for top performers and goal-makers). To make it on the top-performers, high schools had to reach the 90th percentile for any category, including standardized tests in English or math, graduation rates, participation in advanced opportunities or growth in English language proficiency. Compass Public Charter Junior/Senior High School. Meridian Medical Arts Charter High School. Meridian Technical Charter High School. Taylor’s Crossing Public Charter School. West Side Senior High School. The state’s largest school district, West Ada, had the highest number of top-performing high schools. Several schools, including Meridian Technical Charter High School, Renaissance High School, Mountain View High School, Meridian Medical Arts Charter and Idaho Fine Arts Academy were recognized for performance on the English language arts or math standardized tests (both, in some cases). Several charter schools and small high schools were also recognized. 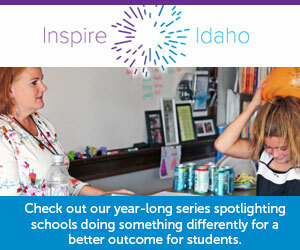 New Plymouth was honored for participation in advanced opportunities programs, Coeur d’Alene Charter Academy was recognized for math and English scores and Melba, Notus and Grace were lauded for their graduation rates. The list of top performers include 15 charter schools and 15 schools on four-day schedules. The top performers and goal-maker schools don’t receive any additional funding for making the lists. Karlynn Laraway, the State Department of Education’s director of accountability and assessment, said she hopes other school leaders will reach out to the goal-makers and top performers to collaborate and share best practices. State leaders were required to release the lowest-performing schools list under provisions of the federal Every Student Succeeds Act. They were not required to identify or honor top-performing schools, but chose to also recognize schools that were on track to meet their goals or already performing at some of the highest levels in the state.